In 2012 the Association launched an exciting new magazine called ‘Touch Not’. This replaces the annual newsletter. Touch Not updates members on what is going on in the Association, gives news on members and associated clan associations. Contributions and photographs are always needed. For details on where to send, please see our Contact Us page. 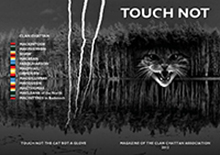 Here is the first edition of Touch Not.